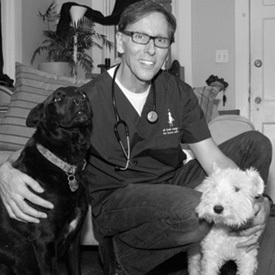 Richmond veterinarian Bob Magnus brings high quality, personalized veterinary medicine to central Virginia cats and dogs, blending modern medicine and technology with old school service grounded in common sense. Our patients enjoy the comfort and safety of being examined in their homes, while our clients enjoy the ultimate in convenience at a reasonable price for the best value in Richmond pet care. Just about everything that can be done in an exam room can be done in your home: Well and sick exams, vaccines, many diagnostic tests and should the time come, peaceful euthanasia. A typical appointment lasts 45 minutes, 3 times longer than the average office visit, allowing Dr. Magnus to examine and observe your pet on it’s home turf and to discuss your pet's care with you. Day, evening and weekend appointments are available. Fees are itemized and comparable to traditional Richmond vets with the addition of a modest travel fee. Packages are also available. 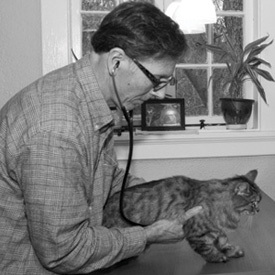 inpatient services such as those requiring anesthesia are not appropriate for home visits and Dr. Magnus will perform these services in a hospital setting as needed and will provide transportation for your pet. Many minor emergencies may be treated at home or Dr. Magnus can coordinate your pet's care with a 24 hour specialty hospital as needed. Please contact us for appointments, estimates or more information about our services.